Yes, that is what I sound like when I’m indulging in one of my favorite “treats” – goat cheese. I had always liked goat cheese, but after our vacation to visit my husband’s family in Spain a couple years ago – I have become a fan of goat cheese. Goat cheese on crackers, with salami, top on a salad or pasta, stuffed with chicken….there are so many wonderful combinations. If you are one of these type people that has tried goat cheese only once and now swears you will never try it again – I’m here to change your mind. In Missouri we have lots of wonderful goat cheese operators that sell their products at many farmers markets and other marketing outlets. Another benefit of Goat cheese, like goat milk, is it is easier on the human digestive system and lower in calories, cholesterol and fat than its bovine counterpart (but that doesn’t keep me from my cow’s milk). Goat cheese is rich in calcium, protein, vitamin A, vitamin K, phosphorus, niacin and thiamin. So, why not give it a try – improve your taste palate and your health! 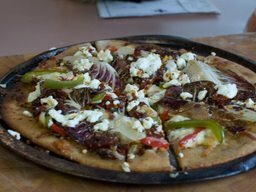 One of my family’s favorite goat cheese recipes is our McConnell Goat Cheese Pizza. You can incorporate whatever your favorite vegetables are (we like to use bell peppers, eggplant, olives and sun-dried tomatoes). 1 1/2 cups topping of choice: sliced bell peppers or roasted red peppers, caramelized onions, sautéed mushrooms, eggplant, chopped olives, sun-dried tomatoes or anchovies. Dissolve honey or sugar in 1 cup warm water. Add yeast, and set in a warm place for about ten minutes. Foam will form on the surface of the yeast. Meanwhile, put the flour into the food processor (using metal blade) with a dash of salt. Drizzle in the olive oil, followed by the yeast mixture. When the dough forms a ball (motor will begin to slow down), place it in an oiled bowl, cover with plastic wrap, and let it rise in a warm place for 1-2 hours. Punch down and roll into desired shape. Cover the surface of the dough with sauce, and top with 8 ounces of goat cheese and toppings of choice. Bake in preheated 400 degree oven for 10-14 minutes until crust turns golden. Brush the edge of the crust with a little olive oil before serving.